Over 20,000 people gathered in Tel Aviv’s Rabin Square overnight to commemorate the 15th anniversary of the assassination of Israeli Prime Minister Yitzhak Rabin. In the spot where Rabin was shot dead, President Shimon Peres told the crowd those favouring peace would prevail but blame Arabs for the delays. “There are still those that wish to remove the Jews from Israel and that these people do not make the way to peace any easier,” he said. “The road to peace is long and difficult, and our neighbours are not helping us, but we will not be denied the hope for peace nor from attaining it”. It wasn’t a neighbour that killed Rabin, it was one of the family. Rabin was murdered after a peace rally on 4 November 1995. His assassin was Yigal Amir, an ultra-nationalist Jewish extremist who opposed trading land to the Palestinians for peace. Amir was sentenced to life in prison. Many branded Rabin a traitor for pursuing the Oslo Accords and some fringe extremists were calling for his death. The first native-born Prime Minister of Israel, Yitzhak Rabin was born in Jerusalem in 1922 of a Ukrainian-Belarusian family. Rabin grew up in a spirit of activism and his parents were avid volunteers. After attending the School for Workers’ Children, Rabin spent two years at a kibbutz before enrolling in the Kadoorie Agricultural School, at the foot of Mount Tabor. The school was surrounded by Arab villages, and daily routine included defence training and guard duty. 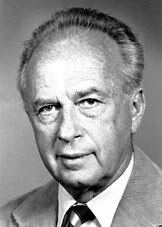 At Kadoorie, Rabin joined the Haganah, the Zionist military organisation.During the war Rabin served as a scout for Allied units invading Syria and Lebanon against the Vichy French Army. But his friendship with Britain ended in 1945 when his battalion attempted to free 200 Jews from a British internment camp near Haifa. He was arrested in June 1946 and served five months in prison. In the Israeli war of independence Rabin safeguarded convoys of food, ammunition and medical supplies to beleaguered Jerusalem. He was also chief operations officer in the campaign to drive Egyptian and Jordanian forces from the Negev. Rabin met Nasser, then an Egyptian army officer, where they discussed the military situation and shared a bowl of fruit. Rabin rose to become the second ranking officer in the IDF. He was chief of staff during the Six Days War and he recommended a pre-emptive strike. He left the armed forces after Israel’s victory in 1967 and served as ambassador to Washington for five years. He joined the Labour Party and was appointed minister of labour in Prime Minister Golda Meir’s 1973 government. Protests over the poor preparation in the Yom Kippur war forced Meir’s resignation and Rabin was elected head of the Labour Party, and prime minister. His first term of office was dominated by negotiations with Egypt and Syria, mediated by Kissinger. Rabin authorised the attack on hijackers at Entebbe in Uganda in 1976 but was forced to resign a year later over reports his wife had a secret US bank account. He returned in 1984 as Defence Minister in a new unity government. He held the post for six years and he disentangled the IDF from the disastrous 1982 invasion of Lebanon. After the collapse of the unity government, Rabin became Labor leader again and won the 1992 election with the help of minor parties. His government made advances in the peace process, signing the Oslo Accords with Arafat’s PLO in 1993 and the Israel-Jordan Treaty of Peace in 1994. He was also planning to concede the Golan Heights to Syria. Rabin, Shimon Peres and Arafat were rewarded with the Nobel Peace Prize in 1994 “for their efforts to create peace in the Middle East”. His efforts were lauded overseas but detested by many at home. Far-right law student Yigal Amir was deeply unhappy with Rabin’s peace moves. Amir appealed to the traditional Jewish legal concept of din rodef (law of the pursuer) to justify the murder. The tradition comes from the Talmud allowing a bystander to kill someone who is pursuing another with the intention of murder. Amir claimed din rodef applied because Rabin’s peace plans were endangering Jewish lives. On 4 November 1995, Rabin attended a Tel Aviv peace rally in Kings of Israel Square (now Rabin Square). When it ended Rabin walked down the city hall steps towards the open door of his car. Amir fired three shots with a semi-automatic weapon. Two bullets struck Rabin and a third injured a bodyguard. Rabin was pronounced dead 40 minutes later at Tel Aviv Medical Centre. While Rabin’s death was a huge shock and embarrassment for Israel, his Labour Party did not benefit. Hardliner Binyamin Netanyahu was a surprise winner of the 1996 Prime Ministerial election. He set Israel on a path of conflict it has yet to emerge from. In the 15 years since Rabin’s death, no Israeli leader has come close in reaching out beyond the pain of its history to confront the reality of Israel’s precarious geography. In 1845 a devastating blight hit the Irish potato crop, the primary diet of millions of people. It wasn’t the first of its kind, but it was the worst. That is until the following year which was worse again. A third blight in 1848 left Ireland reeling in a way it has never fully recovered from. Millions died, and millions more fled to Britain and North America. Today, the island of Ireland’s population is two million less than it was in 1845. There was well meaning sympathy next door in the wealthiest country on earth, but the problem was ignored whenever a solution threatened to interfere with British financial interests. Farmers were bewildered as a splendid crop decayed in front of their eyes. Wild theories were put forward. Some blamed static electricity in the atmosphere generated by smoke from locomotives that had just come into use. Others said the culprit was “mortiferous vapours” from “blind volcanos” deep in the earth. Another school of thought blamed a recent fashion: the collection of guano manure. British Prime Minister Robert Peel asked his friend Dr Lyon Playfair to investigate. Playfair headed a Scientific Commission to see what could be done to save the Irish potato. He studied under Liebig but was a better courtier than chemist. Playfair asked the editor of the leading horticultural paper in Britain, Dr John Lindley to join him on his expedition. They were met by eminent Irish Catholic scientist Professor Robert Kane. Peel knew Kane was investigating the problem and had mentioned it in a book called The Industrial Resources of Ireland. Kane would provide local knowledge and between them, Peel hoped, they would come up with a “dispassionate judgement”. The Commission quickly found the problem was worse than reported. They estimated half the crop was destroyed. Their mission became finding a method of preventing sound potatoes from rotting. But ignorance of Irish conditions proved the Commission’s undoing. The traditional Irish method of storing potatoes was to keep them in a simple pit where tubers could be partially protected from frost and rain. The Commissioners advised farmers to dry the potatoes in the sun and then put them in a trench covered in turf. They gave complicated instructions on sifting packing stuff using unslacked lime, burnt turf and dry sawdust. There was a laundry list of tools required and hints on how to make bread from the starchy material. 70,000 copies were printed and farmers were told if they did not understand instructions they should ask their landlord or clergyman. The Commission produced “four monster reports” to the Peel Government in three weeks. Hopes the starchy material would provide sustenance were dashed as was the possibility of separating the good and bad bits of slightly blighted spuds. It didn’t matter what people did, the potatoes melted into a slimy decaying mess. Senior landowners warned Dublin Castle the problem was getting out of hand. Lord Clare told the Irish Under-Secretary he “would not answer for the consequences” if a famine occurred. With the year’s crop destroyed “how were they to survive to August 1846?” Clare asked. One person suggested the 12,000 police and army horse supply of corn be cut while the Duke of Norfolk said the Irish “should learn to consume curry powder” which nourished India. On 28 October 1845, Dublin Corporation called for a committee to advise the Lord-Lieutenant of Ireland Lord Heytesbury on measures “to avoid calamity”. The committee led by Daniel O’Connell proposed corn exports be stopped and the ports thrown open for free import of food, rice and Indian corn. Ireland also needed food stores and public works. O’Connell suggested a tax on landlords to pay for it. Heytesbury was unimpressed and said the evidence was not yet in. “It was impossible to form an accurate opinion…until digging was complete,” he said. The plans needed to be “maturely weighed”. The Freeman’s Journal condemned Heytesbury. They summarised his message as “let them starve”. This was bad for Peel, but it was worse for Ireland. In England, publicity for the fate of the Irish was drowned by the domestic impact of the laws. Farmers would lose out if duties on imported grain were lifted. Opponents of abolition denied there was a problem in Ireland and said the change was unnecessary. The Tory Mayor of Liverpool refused to call a meeting for the relief of Irish distress while the blight was “the invention of agitators”. To express the opinion the blight existed, set the speaker out as a dangerous radical. The abolition question split Peel’s protectionist Conservative Party. There was an overwhelming majority in Cabinet against him but Peel refused to resign. Playfair produced his final report on 15 November. It said late rainy weather had made the problem worse than before. But the Cabinet was unmoved. On 5 December Peel resigned. After “ten famous days” opposition leader Lord John Russell told Queen Victoria he too found it impossible to form a government. The poisoned chalice was handed back to Peel to carry out Corn Law reform against his own party’s wishes. Ireland’s fate lay in his hands but they were tied behind his back. As 1846 began, power in Ireland passed to increasingly powerful Treasurer Charles Trevelyan. Trevelyan had little sympathy for the Irish whom he felt did not help themselves enough. He undermined Peel’s relief plans of Indian corn. The Irish gave up hope on English assistance and prayed for a good harvest in 1846. The second failure did all the damage. The British had charity fatigue second time round and Trevelyan shut down the relief operation. Peel got his Corn Law repeals through at personal cost. On 26 June 1846 the Whigs and Protectionist Tories combined to bring him down. He was defeated by 73 votes and resigned three days later. As an observer said the vote “had as much to do with Ireland as Kamschatka”. But with Lord John Russell in power supported by Trevelyan, any hope Britain would intervene in the calamity disappeared. Britain practised genocide by omission, and sowed the seeds of Ireland’s 20th century rebellions. 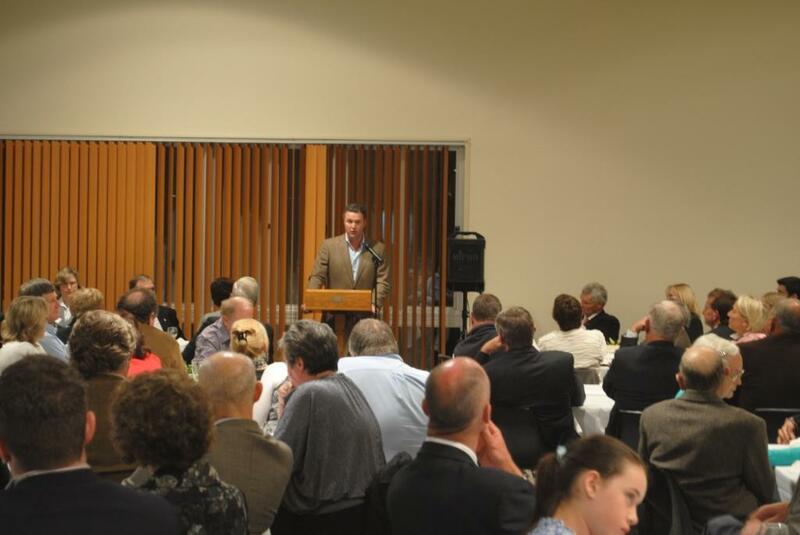 The Liberal National Party held a shadow cabinet meeting in Roma last week where they re-committed their support to the Surat Basin resource region at the centre of the $30b mining approvals from Environment Minister Tony Burke last week. Queensland Liberal National Party’s support of the massive coal seam gas developments might be assumed at a matter of course. The party has been pro-development in most of its guises through the years. But the ruling Bligh Government is also in favour, desperate for royalties from the deals. The Opposition has been forced to play the green card in order to make a point of differentiation. They are adding to concerns about the groundwater released during the gas extraction and possible damage to the water table. The position hides tensions: the Nationals are comfortable digging in for the farmers who grumble about wells on their properties while the Liberals want to see the deals with China sealed as soon as possible. There is a good reason for haste; they want to be in power when the money arrives. Bligh’s trickery and Rudd’s federal defeat has left Labor on the nose in Queensland. The LNP won 21 out of 30 Queensland seats in the 2010 Federal election. Queensland will have an election either late 2011 or early 2012. If polls are to be believed, the LNP will win in some comfort. The party will need to adjust to the mindset of government over the next 18 months as grapples with what kind of administration it wants to be.The LNP is a hybrid party formed in mid-2008 after a long and difficult birth. The Nationals were always the bigger entity in Queensland and their members were enthusiastically in favour of merger. After four defeats to Labor, they were anxious to regain power by any means. But the Queensland Liberals were divided with the right faction in favour but moderates opposing. John Howard rejected the idea of a stand-alone Queensland amalgamation in 2005. In 2006 Senator Barnaby Joyce pronounced the last rights on it saying it looked and smelled like a dead duck and probably was one. Two events in 2007 put it back on the agenda. When the Liberals did not contest Brisbane Central after Peter Beattie resigned, it angered the Nationals and Liberal Deputy Leader Mark McArdle admitted they failed the electorate. Then in November, the Federal Coalition lost the election and Howard lost his seat. The biggest obstacle to merger was gone. When Lawrence Springborg replaced Jeff Seeney as Nats leader in January 2008, he pressed forward the amalgamation agenda over the head of opposing Liberals. They outmanoeuvred opponents in several ways. They got Federal MPs onside by guaranteeing them pre-selection for the next election. Secondly the two party presidents (both in favour of merger) conducted polls of branch members which found an overwhelming majority in favour of merging. Thirdly the new party would become the Queensland division of the Liberal Party and have an affiliation with the federal Nationals. Nats President Bruce McIver set a timetable for amalgamation calling a constitutional convention for 26 July 2008 to make a decision. Pro-merger Libs agreed to meet on the same day. Two days beforehand state council narrowly voted to postpone, but the pro-merger faction went to the courts and secured a Supreme Court judgement to ensure it went ahead. At both conventions on 26 June, the merger was approved. McIver was elected president and former Libs state president Gary Spence became deputy. Springborg was anointed leader of the combined entity with McArdle as deputy. Eight months later the Federal Council of the Liberal Party ratified the new LNPQ as its Queensland Division. Desperation drove the two parties together but it did not pay immediate dividends. Anna Bligh clung to power in the 2009 state election despite losing eight seats. Springborg resigned after his third defeat and handed over to former dentist John-Paul Langbroek. Langbroek is an ex-Liberal and his succession wasn’t an easy one, winning possibly by one vote. Almost 18 months later, the rumblings in the cabinet room continue with infrastructure and planning spokesman David Gibson resigning from the frontbench after Langbroek called for a ministerial reshuffle without consulting colleagues. Tim Nicholls, who Langbroek defeated for the top job, is not ruling out a challenge. Only one of two people can become Premier in the next Queensland election and Nicholls is not one of them. Given Labor’s latest catastrophic polling in Brisbane, neither is Anna Bligh nor anyone in the party that might overthrow her. In what is shaping up to be a drovers dog election, the next Premier of Queensland will be either JP Langbroek or Lawrence Springborg. The “Borg”, as he likes to be known, remains powerful as deputy and the unofficial head of the Nationals wing of the party. But three defeats have shown he is not trusted in the metropolitan areas. It is up to the more likeable Langbroek to step up in the next 18 months to show he is Premier material. I saw signs of it when he made a major speech here in Roma last weekend. Springborg and Nicholls were absent, but the rest of Langbroek’s cabinet had the steely determination of a party about to seize government and were looking seriously at the problems that will bring. Philosophical differences means the marriage of the Nats and Libs remains fragile but the smell of victory should keep them away from the divorce courts in the short to medium term. Haiti’s capital Port-au-Prince is bracing itself for an outbreak of cholera as the disease which has killed 200 in the countryside spreads to the city. The five confirmed cases in the capital are among more than 2,000 people infected in an outbreak in the Artibonite region north of Port-au-Prince. At least 208 people have died with that figure likely to rise in the country’s first outbreak of cholera since 1960. The outbreak is the latest disaster to hit the poverty-stricken country still struggling from the devastating 7.0 earthquake which left much of the country in ruins last January. Cholera is an acute intestinal infection caused by bacteria in human faeces and can be transmitted by water, foodstuffs and, more rarely, from person to person. The main symptoms are watery diarrhoea and vomiting, which lead to severe dehydration and rapid death if not treated promptly. According to the World Health Organisation, there are three to five million cholera cases every year causing between 100,000 to 120,000 deaths. The WHO is worried about a new and more virulent strain of cholera that now predominates in parts of Africa and Asia, as well as the unpredictable emergence and spread of antibiotic-resistant strains. Because brackish water and estuaries are natural reservoirs of this strain, cholera could increase where there are rising sea levels and increases in water temperatures. While it is too early to tell what is causing the Haitian outbreak, conditions in the IDP camps remain primitive and ripe for disease in areas with limited access to clean water. 230,000 people died in the quake. 1.2 million people were displaced as of August 2010 and a further 1.8 million are affected. According to a post-earthquake fact sheet produced by USAID, the majority of IDPs in Artibonite are “residing with host families, straining resources and creating housing space issues for both groups.” It noted deficiencies in disease reporting processes. There has been a mass migration of 120,000 people from Artibonite to Port-au-Prince in search of a better life. The fraught relationship between mining companies and landowners in rural Queensland took another blow with the mysterious discovery of an illegal poison in eight Origin Coal Seam Gas drilling wells 350km west of Brisbane. The find of the banned toxic chemical BTEX comes just months after the Queensland Government ordered Cougar Energy to shut down its Underground Coal Gasification plant near Kingaroy when water tests detected similar compounds of benzene and toluene in groundwater monitoring bores. CSG is a different technology to the unproven UCG. However, the BTEX find puts a cloud over an industry about to take off in the mineral-rich Surat Basin. On Friday Federal Environment Minister Tony Burke gave conditional approval to the GLNG (jointly owned by Santos and Petronas) and BG plan to export $30 billion of CSG to Chinese markets via Liquefied Natural Gas plants in Gladstone in the coming 20 years. Neither company were directly affected by the BTEX find which occurred at eight Australia Pacific LNG (jointly owned by Origin and ConocoPhillips) coal seam gas sites between Miles and Roma. The industry has been on the defensive over the outbreak. APLNG is likely to be the next major CSG player to have its environmental impact assessment tested by government. Their EIA has been with Queensland Coordinator General Colin Jensen since January. Jensen has held off his decision awaiting the Federal Government decision on GLNG and BG. 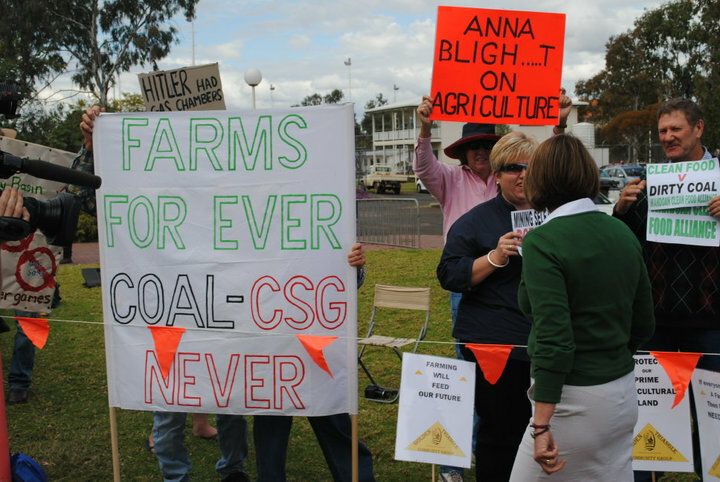 Landholders in CSG areas are unhappy about land and water impacts. Given that Burke imposed more than 300 strict conditions on GLNG and BG, it is likely the Origin/ConocoPhillips project will have to address these also. The BTEX contamination is an added headache. On Tuesday Origin released an ASX statement saying they had found traces of BTEX in fluid samples taken from eight exploration wells. They said they advised relevant landowners, Western Downs Regional council (but not apparently the Roma-based Maranoa Council which was also affected) and the Queensland government. They told Sustainability and Climate Change minister Kate Jones there was no evidence of environmental harm or risk to landholder bores. Jones requested confirmatory testing by an independent service provider. It come days after the Queensland Government banned BTEX from all coal seam gas operations. Minister for Natural Resource Mines and Energy, Stephen Robertson told parliament BTEX petroleum compounds were not used in Queensland CSG operations but have been used in overseas oil and gas operations in fracking. Fracking is the controversial process that involves pumping fluid at high pressure to fracture a coal seam to allow gas to flow into wells. The Australian Petroleum Production and Exploration Association say chemicals make up less than 1 percent of fracking fluid and the risk to public health was negligible. BTEX is extremely toxic. As well as being a cancer-causing compound, there is a history of harmful effects on the central nervous system. Because of the solubility of most BTEX components they are also prone to leaching into the underground waterways polluting areas larger than the original contamination site. BTEX gets its name from its make-up: petroleum compounds containing benzene, toluene, ethylbenzene and xylenes. They are aromatic hydrocarbons occurring naturally in crude oil at low levels. BTEX comprised 35 percent of all US gasoline (petrol) in 1990. When the EPA found excessive benzene concentrations in city air, the culprit was identified as the aromatics. While it was subsequently decreased, it still makes up a significant component of petroleum. The Queensland Government furniture firesale continues as they soften the market for the crashlanding of QR National. In one of the first major share offerings since the GFC, the rail freight business is being pitched as a “growth story” worth 6.6 to 7.8 billion dollars. Premier Bligh acknowledges dividends will be low and investors will not make a quick killing. What she does not acknowledge is this slow long-term growth makes it ideal to remain in government hands. There is another reason the sale is bad. Privatisation costs money and the cost is deducted from the sale price, meaning the vendor pays for the transition. Australian and Queensland tax payers will lose tens of billions in long term revenues. The “book value” of QR National is $7.4 billion but it does not measure other aspects including future earnings, goodwill and the power of being the leading producing of freight services in Australia. QR National is the biggest of five assets being sold as Queensland buckles under financial penalties caused by its AA credit rating. With $52b of debt to service, international credit demanded these tasty morsels be released in downpayment. The unfolding financial disaster left Bligh in a no win situation after her election. The only people that wanted these assets privatised would never vote for her. Her base detested the move and her credibility was shot to pieces after she introduced the sale without a mandate in the 2009 election. 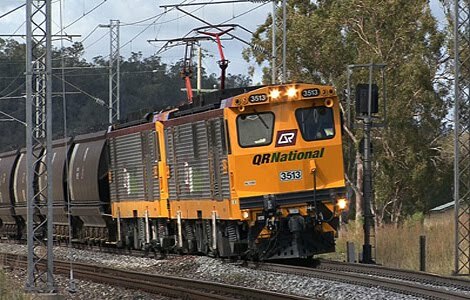 QR National are the largest rail freight haulage business in Australia by tonnes hauled and are strong in coal haulage which has doubled in ten years. QRN operate 2,300 of dedicated railway lines in five states. Their outlook is strong having invested $3.4 billion in three years in rolling stock while expanding its network. Another $3.8b is earmarked in expansion programs in the next two years. QR National may be the jewel in the crown but the four other assets are also sparkly. Queensland’s largest cargo port, the Port of Brisbane could fetch $2 billion. Queensland Motorways operates the tolling franchise on the Gateway and Logan motorways and is worth $4.5 billion. But as Professor Ross Guest told RACQ a likely sale price of $3 to $4b “would therefore transfer net worth from Queensland taxpayers”. The fourth is Australia’s most northerly coal port: Abbot Point Coal Terminal. Abbot Point is 25km north of Bowen and is the quickest route to China. The port is valuable because it is one of few ports on Queensland’s eastern seaboard where very deep water is so close in-shore. Whitsunday Regional Council Mayor Mike Brunker said the terminal might go for half its $3 billion asking price because of crucial missing links in the railways providing coal to the port. The fifth asset is a 99-year licence for Forestry Plantations Queensland and it is already lost to the state. The smallest of the five, it was the ideal candidate to be first cab off the privatisation rank. The licence to manage, harvest and re-grow plantation timber on over 200,000 hectares of plantation lands was sold for $603 million at the end of June to American company Hancock Timber Resource Group. Professor Gary Bacon, adjunct professor with Griffith University’s Environmental Futures Centre said the state’s forestry assets was a bargain. He said if the land remained in government hands, the right to grow and harvest trees on it would be worth an estimated $1370 million. This figure came from parliamentary research commissioned by Bruce Flegg and while politically motivated, it shows a loss of $767m on unrealised earnings for the state. Hancock Timber Resource Group are also the target of Greens’ ire over their Victorian operation which will clearfell much of the Strzelecki Ranges. QR National will dwarf the Forestries sale in scale, impact and money lost to the state. In parliament on 7 October, Treasurer Andrew Fraser called the QR National share offer a “historic moment for QR, for Queensland and indeed for the nation.” Australian interest was an afterthought. This is a major blunder given QR National’s size and reach into the important NSW market, a state which will recover its crippled mojo when Labor is turfed out of power in 2012. The Queensland Government is expecting to receive between $3.6 billion and $5 billion from the float, but the true value of future earnings is not included. Bligh is aware of this but is pressing on. Her fear of bankers is worse than her fear of voters who don’t want the sales to proceed. Billions of dollars will be lost to Australia. If Bligh cannot act in a notional national interest, then Prime Minister Julia Gillard ought to. She could buy the remaining assets for the cost of a tenth of a stimulus package. Tens of billions are leaving the economy which will not be compensated by the benefits of privatisation. Stephen Bartolemeusz gives the game away when he says the value of QRN is in privatisation. Given the company’s strong set of businesses with dominant market positions it ought to release considerable value. Against that he outlines reasons why investors won’t pay premium prices: The grandfathering arrangements to protect jobs, the retention of 25-40 percent Government ownership and a 15pc ceiling on individual shareholding. Queensland’s troubles show federalism is a mess and economically unsustainable. State-based power structures are crippling Australia. In the “future directions for rural industries and rural communities” session in the 2020 summit two years ago, session chair Tim Fischer admitted their solutions saw them “almost demolishing the states”. It’s a worthy vision for 2020 – the quicker it happens the better.